The possibilities are endless for this organization cabinet. I admit, I want one of these so badly. I've been debating. Does it go in my front hall for storage of outerwear? Does it go in my kitchen for food? Does it go in my bathroom for my 3,000 products? My daughter's playroom for toys? Argh! 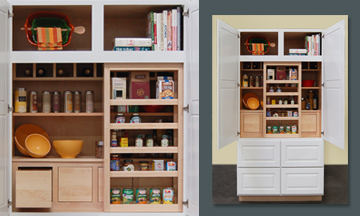 A natural in the kitchen, with plenty of drawers, shelves, cubbies and a sliding spice rack to keep essentials at hand. We can also imagine these feature-packed cabinets in a home office, artist’s studio, craft room, kid’s room or a well-appointed laundry. Leave the doors off or add open for glass doors to create a unique display space.